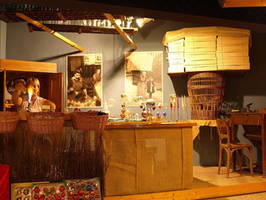 Since the beginning of 1992, Krebs Glas Lauscha has been responsible for preserving the centuries old tradition of Lauscha artistic handwork while combining it with the latest trends to become one of the leading manufacturers of mouth-blown glass Christmas ornaments in every shape and colour. After the reunification of East and West Germany, it was not clear how the existing company, “VEB Thüringer Glasschmuck” with its 1300 employees, could continue. The established markets from East German times collapsed, and the wares had no value in the West anymore. 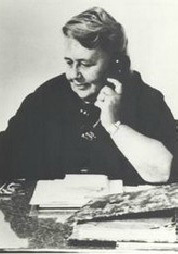 Many workers became unemployed. At this time, Krebs Glas, a leading manufacturer from former West Germany, began to pay attention to the manufacturer in former East Germany. Although Krebs already had modern factories in Rosenheim, Germany, and Roswell, New Mexico, they had the idea that it would be wonderful to make high quality ornaments using traditional methods. Where better to do this than in the birthplace of glass Christmas ornaments and the hometown of the best trained and most experienced glassblowers in the world? 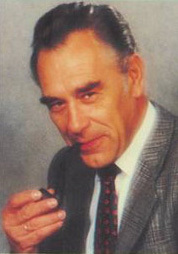 In November 1991, with the privatization of VEB Thüringer Glasschmuck, Krebs Glas Lauscha GmbH was founded. With only 6 weeks development and working time, the first collection was ready for the marketplace in January 1992. This was possible because of the over 50 years experience in Christmas ornament manufacturing that the Krebs family brought with them. Under adverse economic conditions, over 50 permanent jobs were created and 3 million Euros were invested. In a six part hand manufacturing process, approximately 4000 diverse Christmas ornament styles are produced each year, and out of these, approximately 2000 designs are new each year. In the spring of 1993, it was finally too difficult to move production between various small buildings, and a new building was built. On a large building lot, a modern building was erected, with consideration for environmental protection and organizational workflow. 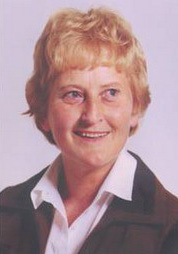 As business increased, new offices and a warehouse were built and dedicated in May 1999 surrounded by 150 invited guests. This building was devoted entirely to customer service – offices, meeting rooms, and of course, the 200 square meter showroom – everything that the customer needs to learn about the latest collections and meet with the creative and business teams. 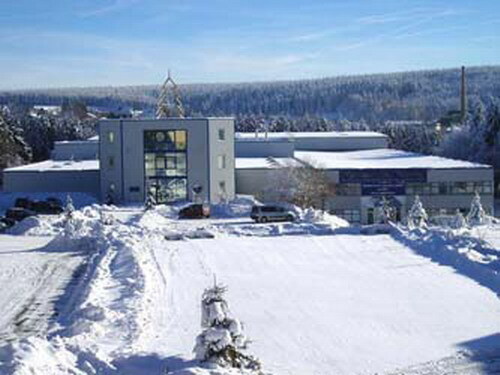 Since autumn of 1999, a further highlight of Krebs Glas Lauscha GmbH is the year- round factory outlet, right across from the popular Rennsteig nature path. Housed in a lovingly restored turn-of-the-century building, visitors can enjoy the pure Christmas feeling and shop from the almost limitless collection. Most of the current pieces are there, as well as limited run pieces, and naturally, one-of-a-kind samples that will never be found anywhere else. A glass ornament blower and a glass ornament painter demonstrate what working was like in the little home glass studios of 1900. Retailers are not left out though – on the second floor, there is a retailers’ cash and carry market, including a service elevator. 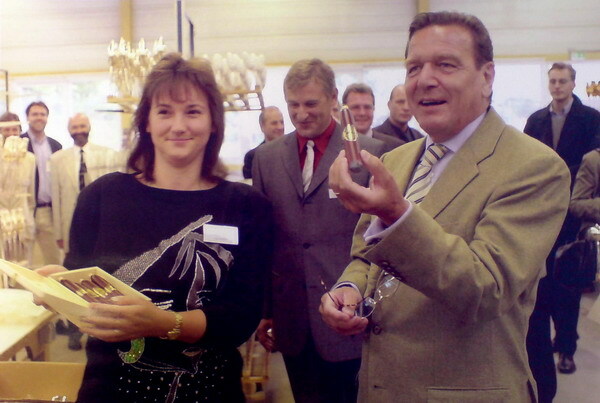 In August 2000 the then current Federal Chancellor Gerhard Schröder visited Krebs Glas. After a detailed examination of our facilities, discussions and praise the dedicated cigar smoker received a special departure gift – a box of glass cigars, produced especially for him by our workers. The inscription? Let these be the healthiest cigars you have ever received! In order to continue to compete in a global marketplace, Krebs Glas Lauscha merged with the other Krebs firms, Christmas by Krebs in Roswell, New Mexico and Krebs International, in Hong Kong, to become Krebs Glass. We continue to focus on what we know best – development and creation of glass Christmas tree ornaments. Within the group, we produced something for every budget, from discount items to completely hand made collectors’ pieces made exclusively in Germany. For our customers it means a complete product line, most efficient production worldwide, and seamless optimized logistics. In this way, we are ready for the challenges of the future.